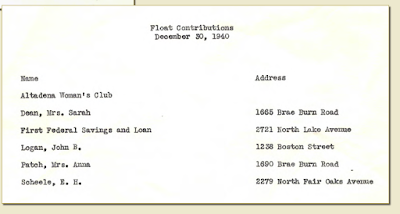 How Much Did a Rose Parade Float Cost in 1941? 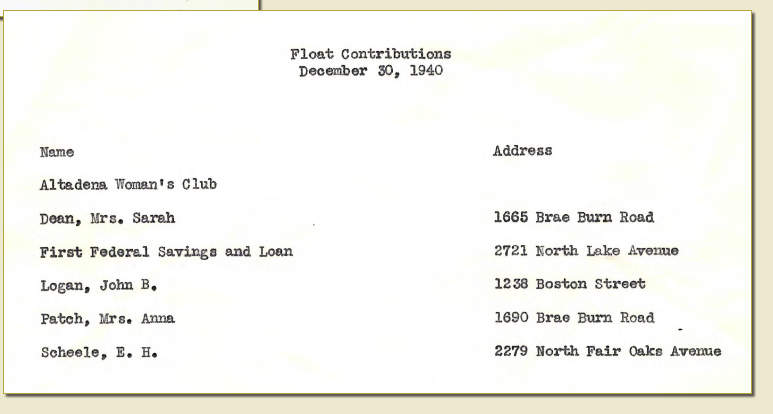 The Altadena Chamber of Commerce sponsored the 1942 float and in 1941 raised funds directly from the community. Most people gave between $1 and $5 dollars. The largest donation was $100. The Chamber kept a record of who gave how much. "On an oval base 24 feet long and 12 feet wide, all in solid heather, will be placed a large shield with an open center, topped by a beautiful golden eagle with seven foot wing spread. Directly below the eagle is a gorgeous flower ribbon bearing the words, "Lest we Forget". 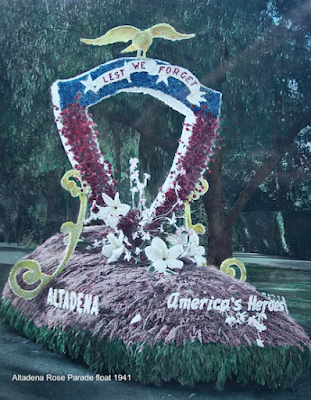 Visit AHS to see an exhibit featuring Altadena's participation in the Rose Parade during the last seven decades. We're open Mondays, Tuesdays and Fridays, 9 am to 1 pm. Our special hours are Saturdays from 2 pm to 4 pm through January 12, 2016. That means you can come in January 2 if you're looking for something fun for all those bored house guests.